De Bruyne takes a sharp free-kick in behind Alonso, who leaves Silva for Hazard but the Chelsea man just watches rather than marks. Silva gets to the by-line and his deflected cross drops to Sterling about 12 yards out. No problem. He calmly finds the back of the net. He can't score from three yards but he sure score from 30! Obviously rattled by his earlier miss, he picks the ball up and thinks 'I'm having this' he smacks an unstoppable effort straight, bang, wallop into the top corner. That is sheer class. The ball bounces around the area and he tries to head back to his goalkeeper. It's an awful header and drops to straight to Aguero about eight yards out. He doesn't miss from there, sweeping it home. That's his 159th league goal - a club record! What a marksman. Another ball bounces around the area, Luiz can only clear it out to Gundogan on the edge who returns it with serious interest. It zooms past Kepa's outstretched glove and into the bottom corner. He strolls up, waits for the goalkeeper to move and rolls it the other way. That's his 11th Premier League hat-trick! He draws level with Alan Shearer in that department. Lovely passing to get in behind the full-back and a tap-in for the attacker inside the six-yard box. Zinchenko did the hard yards down the left and his cross was prodded home by Sterling - his 12th league goal of the season. Aguero scored his 11th Premier League hat-trick, equalling the record set by Alan Shearer. Chelsea suffered their heaviest defeat in any competition since losing 0-7 to Nottingham Forest in a top-flight match in April 1991. Aguero has scored eight Premier League goals for Man City in 2019 - double that of any other player in the competition and more than 11 other Premier League clubs have managed, including Chelsea (seven). 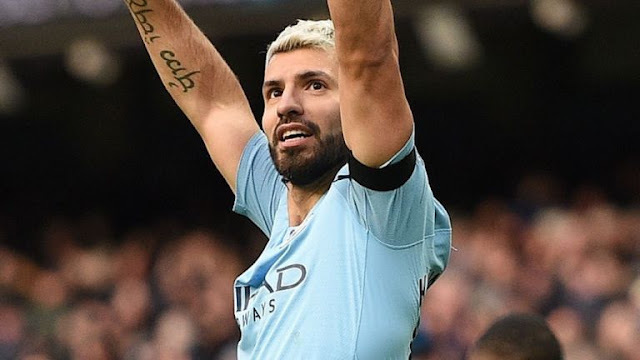 Aguero has scored a hat-trick in his last three Premier League games at the Etihad in the month of February for Man City - four v Leicester in 2018, three v Arsenal in 2019 and three v Chelsea. 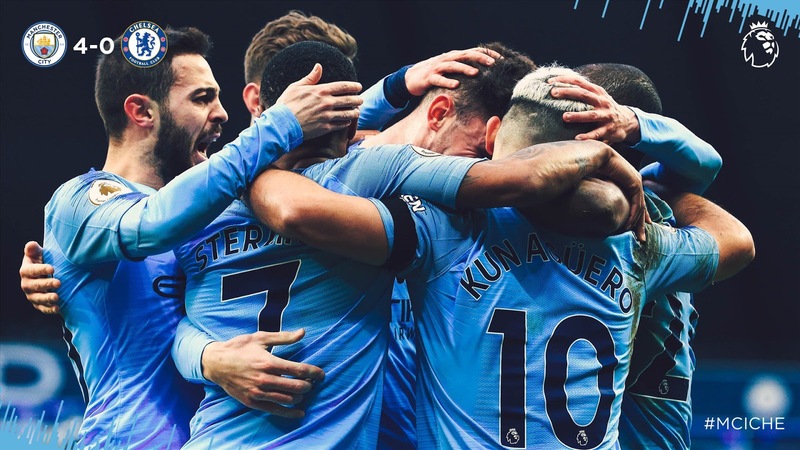 City became the first top-flight team since Tottenham in December 1965 to score more than once in 15 consecutive home league matches. Sarri suffered his heaviest ever league defeat as a manager, with this the first time he'd seen one of his teams concede more than four goals in a match. 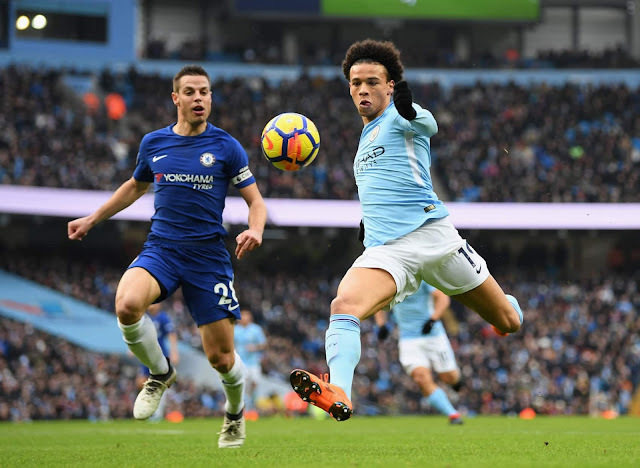 Chelsea's Eden Hazard has had a hand in five goals in his last five games against Man City in the Premier League (3 goals, 2 assists), with the Belgian assisting both of the Blues' goals in the reverse fixture this term. Sergio Aguero has scored 11 goals in 11 home Premier League games for Manchester City this season, including two hat-tricks. He's the highest scoring home player in the competition so far this season. 50% of N'Golo Kante's Premier League assists for Chelsea this season have been for Gonzalo Higuain (2/4), despite the pair playing just 148 minutes together.